Be part of our Big Sleep Out, but do it freestyle! For some, sleeping outside in winter is not possible, or you may want to involve people under 14, or you may have a great idea of your own. Get together with a group of friends, family, or colleagues, and plan your own event. We will support you in any way we can, and give you a Mini Sleep Out Fact Pack. Plan a box set binge sleeping out on a mate’s living room floor. 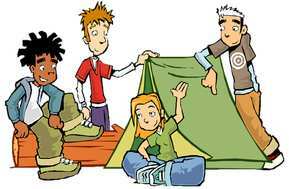 Convince your school to let you camp out in your classroom. Hold a garden shed party. Sponsor your boss to sleep in his car overnight (or get him to pay you not to!). Organise a Cub or Guide night in the local hut. We will ask you to pledge to raise some money, but most important is the taking part and telling people about what you’re doing and why. We can help with advice on getting sponsorship, dos and don’ts with venues for a sleepover, some mad ideas of our own for what you could do and more info. As a group, try to raise over £120.